Poor ole Wrigley. What, with another holiday and holiday decorations, comes new fears and anxiety for our golden retriever puppy. 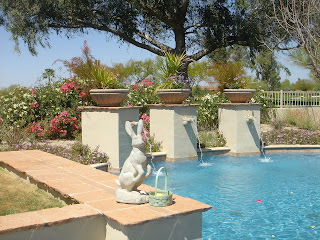 I placed this concrete bunny out on the ledge by the pool the other day. At first, Wrigley was scared of it. He growled at it and barked loudly to let the rabbit know who's boss around here. 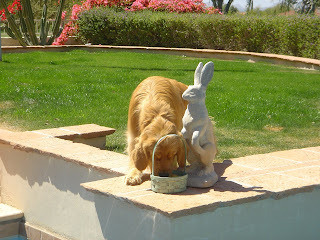 Then, he got up close and noticed the little Easter basket sitting next to the big bunny. 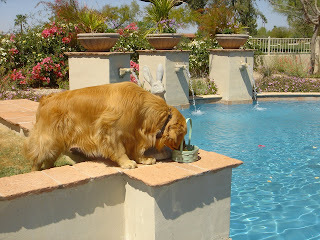 I had placed two concrete lemons in the basket, mainly to keep the basket grounded and not swimming in the pool. But Wrigley, being the eternal optimist, wanted to investigate further to see if they were edible. But his big ole block head got caught in the handle and he was not able to get his mouth on the lemons. Wrigley and the Easter Bunny are now good friends. 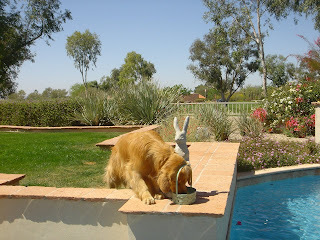 He likes to sit up there on the pool's ledge in the early mornings and soak up the sun together with his new friend. Just wait to see what I have planned for the backyard for the Fourth of July! I think Wrigley will get a 'big bang' out of it! That's too funny. I can so see one of my dogs doing that! You may have to leave the wabbit up though, or wrigly will get lonely. I wonder how long it will be before you have a bunny on the bottom of your pool. We may be kindred spirits - Wrigley was a name in the running for my Riley. Wrigley is such a cutie! Riley would also be afraid of the rabbit, along with crockpots, aluminum foil, wrapping paper, boxes, paper bags, you name it!